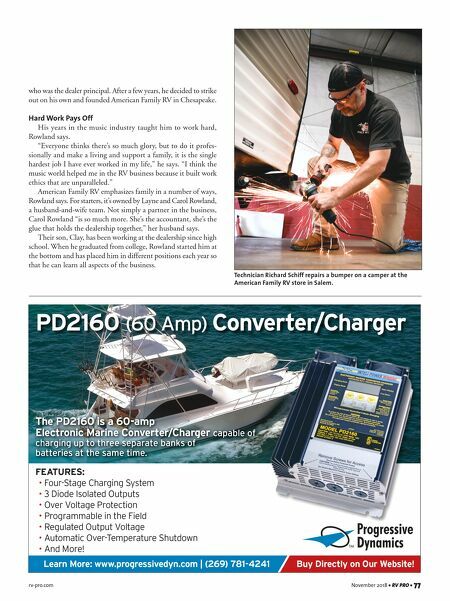 76 • RV PRO • November 2018 rv-pro.com D E A L E R S offer auto mechanics and woodworking classes, but they need to add training that would prepare young people for a career working on RVs. Because of the nature of the work, that would have to include expertise in plumbing, electrical (12 volt and 110), bodywork, painting, and more, he says. Rowland says he sends his techs to training as much as pos- sible, and while his employees do earn their certifications, he places a higher value on knowledge and skill than on official certification. And he says he hires experienced technicians from all over the country. Constant Training is Key Including all three locations, Rowland says he employs about 65 people. They are constantly undergoing training, he says. "We train almost every day, whether is it with our service team in the back or our sales team in the front, and our man- agement has roundtable meetings," he says. One of the things he presses home with his sales staff is the importance of listening to the customer. "I tell my salespeople, you just need to listen. If you listen to them, the campers sell themselves," he says. "We choose three units for customers to look at," he says. When he was doing full-time sales, he says he was good at hearing what the customers were looking for and presenting them with just the right model and floorplan. "The very first one I took them to was the one they ended up purchasing, but they would want to look at five or six more," he says. "They would say, 'We feel cheated if we don't get to look on the lot.'" Rowland says that, occasionally, he will pause in the show- room to listen to a salesperson talking with a family. If he doesn't feel that the discussion is being handled properly, he will walk over, introduce himself, and "take over that conversation and guide that conversation back on the right path." His sales managers do the same thing. A Successful Second Career Act Rowland came to the RV business as a second career. He and his wife, Carol, traveled as professional musicians: He was a singer and songwriter and played the guitar and a variety of other instruments. "There was no stardom-type, superhero claim to fame, but there are many levels of success in the music industry," he says. "I made a good living playing music." Rowland played with a number of bands, which appeared with such names as Pure Prairie League, Charlie Daniels and Delbert McClinton. The last five years of his career, he per- formed solo. As he toured, he traveled by motorhome. However, he says he got tired of dragging his family around. "My son came to me and said, 'Dad, I don't have any friends,'" he recalls. "I told him to finish the school year, and we'd go home. I promised him we would never move again." Rowland played professionally for a little while longer but knew he needed a new career. "The only other passion I had was RVs. So, I went into it as a salesperson with a local dealership, started learning, and liking it," he says. 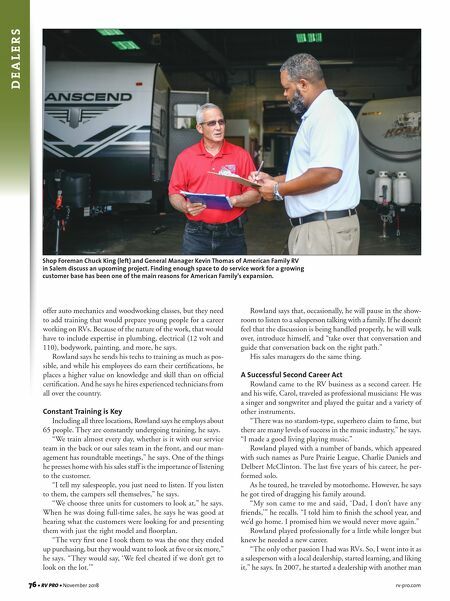 In 2007, he started a dealership with another man Shop Foreman Chuck King (left) and General Manager Kevin Thomas of American Family RV in Salem discuss an upcoming project. Finding enough space to do service work for a growing customer base has been one of the main reasons for American Family's expansion.